My flexible 8/16 ch Tx. It has been my goal to have a flexible, easy to use, while powerful Tx. with ersky9x and sky9x board. power is not a problem any more. step by step I built my flexible while easy to use Tx. The goal is being able to use wither ext/int module as single module tx with one or the other turned off to save power consumption, and use either ext/int module as primary module for 16ch control and use either module 's telemetry capability. I have removable Flysky module, Frysky module and DSMX module. some planes are set up with any of these module. sometimes I just want to attach a telemetry sensor to my non telemetry module linked plane, I can just throw a D4R-II on it, and turn on the int mdoule to get telemetry data. or I found out one plane 8ch is not enough, I can add a 4 ch/6ch rx to fly with >8ch. With all that, I still want to keep the trainer function in all mode/combination. To make this all happen, ERSKY9X recently activated the ppm2 and com2 function on the Sky9x board and let this can be done a lot easier. Thx to Mike. This is the 4 way switch (4P4T) that made this all passible. You can see the cut of traces for ppm and +5V on the back plate to reroute the ppm and power. the red wire route the +5V to the switch, the 3 thin wire route the ext ppm from the switch and the single grey wire direct the ppm1 to the switch. this is after int DHT is placed, the two telemetry connector to com1/2 and the grey wire is connected to ppm2 on sky9x board. This is how the 4 way switch looks like at the back of the Tx. Where the loaction is and just poking out the box. no way to accidentally flip it by a stick switch but it is easy to slide it with one finger. the switch has pretty good ball bearing and stops to make changing the position very crisp. Re: My flexible 8/16 ch Tx. Found a way to mount the DHT antenna without too much trouble while it can be replaced any time. Just use the stub came with the T9x, cut off the bottom thinner stick then cut the top right at the 1st ring. that was designed to fit the top hole. then use a sand paper sand it down about 1/4 mm at the top of the ring to have enough room for the antenna connector to poke out. Use small amount of epoxy inside perimeter of the hole to glue it in place. If you want to use locking ring, then you need to sand off a little more. Without the locking ring looks better to me. set up 16 ch, ersky9x now has the flexibility to set which ch/mixes goes to which ppm (1/2) output. selection of which telemetry port is using. ext or int. Last edited by kaos on Fri Feb 22, 2013 9:12 pm, edited 1 time in total. And these 2 little mod completes my flexible 8-16 ch ERSKY9X Tx. I think it would be the most flexible (i can use any compatible removable module as primary module for 16ch with a simple plug-no wires needed for txd/rxd when the module is added the contact points for the connection pins), while economic (Tx is cheap even with SKY9x upgrade, plus I can use cheaper rx ie. flysky, orange rx, frysky rx), powerful - thx to the ERSKY9X, and easy to use in the field. Any module combination with just one sliding switch. The old charging port is replaced with a PS2 connector for balance charging for either 2S/3S LiFe or LiPo. I don't need to open the Tx any more unless the battery goes bad. this is how the Tx bottom looks like. left round hole for earphone plug, right rectangular hole for mini USB. The other 2 holes now are plugged with dens foam that were used to remove SD card (when direct writing to SD is not implemented yet) and the Txd/Rxd from ext module (now don't need any more because the internal wiring). into the radio. I just did the modification to the module using the existing pins. at the picture I can a PPM jack. The com port is only for telemetry, correct? other COM port and thats it? Looking at the picture of the DHT module I think I only see 3 wires coming from it, other then the switch...those go to the COM port? would be for telemetry should I decide to use it...I think I got it...do I? PPM2 for the DHT. There is now an option as to which COM port is used for the telemetry input. OK...I see it now Mike. It's labeled " AUX PPM OUTPUT". I'm just going to order the DHT right now. Too cool for school I tell ya! when you have two Frysky module, you can use either one as the ppm1/ppm2 and you can use either one as the telemetry source, just choose com1/2. you can even change the com port and see both rx voltage/telemetry data in fly I believe. I know i can during the test. just don't know if that would affect the control during fly. if you don't put the switch in , you will be powering both modules all the time. My V.B board with single Frysky module runs about 160mah and when both modules are running it takes 240-250 mah. Just keep in mind your tx batt time will be quite a bit shorter. the Frysky manual says the DJT or DHT takes 50 mAh, but according to the tx , it is around 80 mah. I have played the tx without module and it is 70-80 mah. wow, we don't ever need to worry about running out of ch any more. I am not sure I have 32 servos to put in a plane. I have a simple slide switch I installed way back when we making our own back lights and the FW was not able to control it. So it's a simple on/off switch that should suffice to turn the module on and off. that will work. The switch i put in will let me turn on/off either ext/int module as I wish. OK, I installed the DHT module. I was meticulous with the installation, went over everything 3 times to make sure I had it right. Nadda! No LED, no beeps, no signal, nadda. I checked to make sure the voltage is passing thru the switch and it is. I have 3.23 volts coming from PPM 2. I don't have the telemetry wires hooked up but that shouldn't make a difference. I'll start reading up on the DHT module. your switch for 1,2, FW is connected correctly? your power line is from the 5V line? and ground to gnd? a pic of your hook up will help. The switch is just connected right out of the package. The only power line I'm using is the 3.3v from the PPM2 port. Ground is also from the PPM2 port. It says nothing in the instruction sheet about 5v. I just hooked up the tree wires that are supposed to got to PPM. I'll hook up the + from the com port to the telemetry port. EDIT: Well I see operating voatage range is 6v-13v...whats this all about? OH..forget that + from the com port...it doesn't have +v. if you look at most DHT install, it is connected to the +5v line on the backboard. I know sky9x board mark the ppm2 as 3.3V. not sure if the 3.3 v is the problem. but I would imagine even 3.3v you should get a led light on. Doesn't the DHT work with battery voltage. At least mine does.. not 5V. I think that 3.3V is too low. obviously 5V works for DJT and DHT. I think you can make a split of that back plate 5V line to your DHT switch. that should work. I'm looking for a detailed picture of how it's hooked up...I really do not feel smokin it or the radio. Kaos, the specs say that the operating voltage range is 6.0V - 13V, how come you want to connect it to 5V?? here are the freakin intructions...it spends more time on drilling the holes then what gets hooked up where and why...very frustrating. 1) Open the transmitter and find a clear position to locate the DHT module, the antenna connector, the small electronic panel. The location of the antenna should be such that there is no metal touching the antenna after it is mounted. 2) Locate the battery power supply line, GND and PPM signal line. These are often a three-wire bundle or ribbon cable connected to a separate transmitter circuit card. 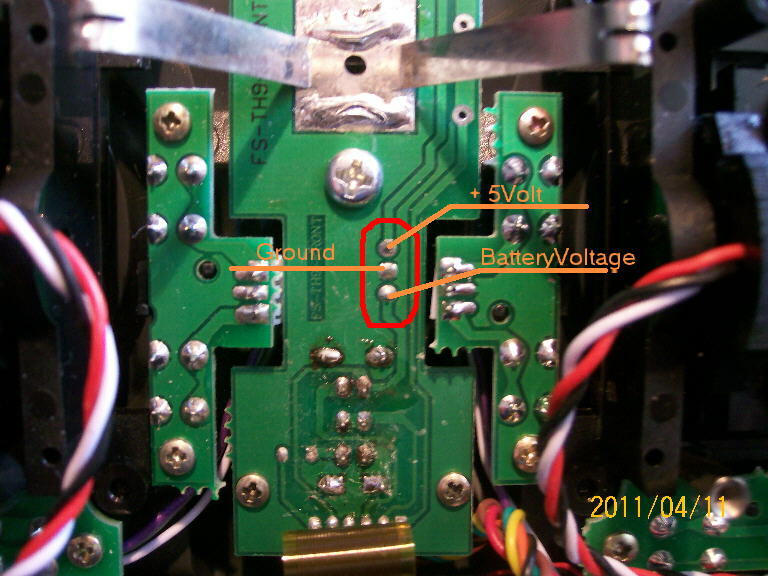 Use a voltmeter and/or oscilloscope to help identify the function of each wire. 3) Drill four holes on the transmitter as the picture guided, two holes on both sides are designed for screw installation, others for green/red color LED and the button.（see picture above）; then drill another hole for installing toggle switch in a suitable place. 4) Attach the transmitter antenna to the RF connector. Turn the transmitter power on and check the power indicator LED on the new DHT control panel. It is normally light RED. My guess is the red goes to 5v+, the ground shoud be fine connected at the PPM2 port. But I mean hey, I mean whoa...there shouldn't be any guessing. jhsa wrote: Kaos, the specs say that the operating voltage range is 6.0V - 13V, how come you want to connect it to 5V?? because all DJT works off the 5v line, and we know it works weel. DHT is the same as DJT without a box. all the instruction/vid on the web i have seen for DHT is also using the 5V line. so I am sure 5V works. less voltage is better as long as it wroks, right? If you want 5V, you have it on the big connector at the bottom, but not on the RF module pins..
then the RChacker marked it wrong. I have another pic marked by someone stating that line is +6V. I may take a voltmeter to check it next time to see exactly what the voltage is. but get it from the 3rd dot from the top will get you the power. I run mine off that line. I guess I was just thrown for a loop because of the 3.3v at the PPM port. I'm just spooked because I've smoked too many things by not being stupid carefull. OK...thansk for you help guys. I'm going to get 2 Rx's in the plane and play around with it....whew again! all the loose screws out of it. well even though it's on a different channel. Can't really play with it tonight...tomorrow I'll see whats up and report back. Reacher10 wrote: Yeah I see that but it looks like alot of people are taking 5v from where Kaos is showing. I take power for mine from there, but I can tell ya, there ain't no 5V in there.. it is battery voltage and you can power it from there..
don't shake it too hard end up with a slip and throw your tx on the ground. I'm just going to power it right from the battery voltage...no reason not to. Just checked with a volmeter, that 3rd dot is 'BATT' power. obviously RChacker marked it wrong.